The foundation of our faith and our forms of worship are the Scriptures (the Jewish books of the Old Testament and the Apocrypha together with the New Testament - and especially the Gospels). We also draw on the teachings of the Apostolic Church and the early Church Fathers in our interpretation of this faith. Anglicans trace their Christian roots back to the early Church, and their specifically Anglican identity to the post-Reformation expansion of the Church of England and other Episcopal or Anglican Churches. Historically, there were two main stages in the development and spread of the Communion beyond the shores of England. 1. Beginning with the seventeenth century, Anglicanism was established alongside colonization in the United States, Australia, Canada, New Zealand and South Africa. 2. The second stage began in the eighteenth century when missionaries worked to establish Anglican churches in Asia, Africa and Latin America. Today and as a worldwide family of churches, the Anglican Communion can claim more than 70 million adherents in 38 Provinces spreading across 161 countries. Located on every continent, Anglicans speak many languages and come from different races and cultures. Although the churches are autonomous, they are also uniquely unified through their history, their theology, their worship and their relationship to the ancient See of Canterbury. By baptism in the name of the Father, Son and Holy Spirit, a person is made one with Christ and received into the fellowship of the Church. 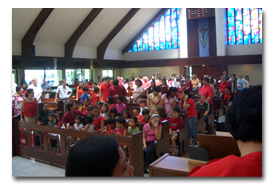 This sacrament of initiation into the Christian faith is open to children as well as to adults. Of course, children are expected to reaffirm as adults the vows made on their behalf as children and this is the sacrament of Confirmation. 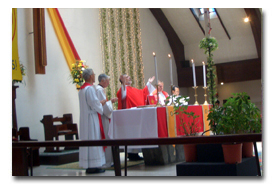 Central to worship for Anglicans is the celebration of the Holy Eucharist, also called the Holy Communion, the Lord's Supper or the Mass. In this offering of prayer and praise, the life, death and resurrection of Jesus Christ are recalled through the proclamation of the word and the celebration of this sacrament. Another distinguishing feature of the corporate nature of Anglicanism is that it is an interdependent Church, where parishes, dioceses and provinces help each other to achieve by mutual support in terms of financial assistance and the sharing of other resources. While all Anglicans and Episcopalians recognize the Archbishop of Canterbury as the leading bishop of our Church, he is the first among equals and not a supreme head. To be an Anglican is to be on a journey of faith to God through Jesus Christ and supported by a fellowship of co-believers who are dedicated to finding Him by prayer, by reason, by experience and by service.